Is there something that you find super interesting that might be totally unrelated to your work? Tim Shea wants you to enroll of the “university of yourself”. He wants you to create space to discover yourself and to give yourself permission to delve deeper into something you love. 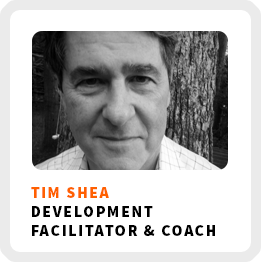 Tim is a learning and development facilitator as a partner at Perret Roche Partners. He works with a variety of organizations to help them discover new possibilities be working with their teams on emotional intelligence, communication and leadership skills. His career path was an unconventional one. His first love was acting, but it didn’t pay well. He then became an IT sales guy to get paid much better, but he was miserable. He finally aligned his passions and talents into his current opportunity. Find interests you love, allowing them to grow and aligning them with paid opportunities. Realizing life is not a rehearsal and moving yourself out of misery. How to be motivated by purpose, instead of by pleasure or pain only. The freedom in recognizing the psychological space of choice. Shifting our perspective on the entire nature of how we exist in the world. Core work activities + habits: 1) Business development through lots of cold calling. 2) Getting better at having productive conversations. 3) Creating content and deliverables for project fulfillment. Superpower: Being present and helping people see beyond their limitation to discover new possibilities. Regains focus by: Fear as well as focusing on not getting sucked into the negativity, continuing to discover and explore and connecting to joy. 90-day goal: Make more money by doing what he loves and is good at, which is organizational development. 3) Think about what you love to do and don’t be judgmental about it, then focus on the love piece.